If you've heard the iPod commercial featuring "Jerk It Out", then you've already heard the best Caesars has to offer. If folks are purchasing Paper Tigers expecting a dozen more tunes like "Jerk It Out" -- by the way, the band claims the title is a metaphor akin to "let your freak flag fly", so please, no angry letters -- they'll soon find that Caesars is guilty of bait-and-switch. While some of Paper Tigers captures the glee and abandon of "Jerk It Out", too much of the album is nondescript power pop. But first, one other musical detour. Even if you're unfamiliar with "Jerk It Out", the album's opener, "Spirit" will leave you with yet another impression of the band: swirling, layered and psychedelic. "Spirit" suggests Caesars has been hanging with fellow countrymen The Soundtrack of Our Lives (though TSOOL's take on psychedelia puts Caesars to shame). It's an interesting approach for the band -- and hey, they've got the Farfisa organ for it -- but it's a sound they don't attempt again on Paper Tigers. It's a shame, too, because tracks like "It's Not the Fall That Hurts", "Your Time is Near", and "My Heart is Breaking Down", despite being inoffensive enough and perfectly competent (how's that for damning with faint praise? ), are overproduced, slick guitar pop. I want to like Caesars more -- I have a soft spot for Swedish pop and garage -- but when compared to (and maybe especially when compared to) Swedish acts like TSOOL, the Hives and the Wannadies, Caesars isn't quite in the big leagues yet. Still, they hint that all hope is not lost. In addition to "Jerk It Out" -- their contribution to the Eurogarage compilation disc that will be released in a decade's time -- the three closing tracks feel much more freewheeling and a lot less calculating than their predecessors. Where many of the above-mentioned tunes sounds a feel like the band is holding back too much, the closing trio of "We Got to Leave", "Soulchaser" and "Good and Gone" rock in a way the rest of the album should have. The guitar jangle of "We Got to Leave", the pulsing keyboard on "Soulchaser" or the big riff on "Good and Gone" -- Paper Tigers would've benefited from more good vibrations like these. That said, "would've"'s won't get us anywhere. The band has done right in the past, nabbing a Swedish Grammy for Album of the Year in '02 for Love for the Streets. 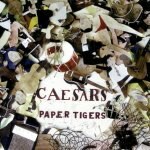 Still, Paper Tigers is Caesars' first release with any stateside buzz -- thanks again, iPod! -- and the band sounds tentative, afraid to step on any toes and too eager to please everyone, shortchanging themselves in the process.